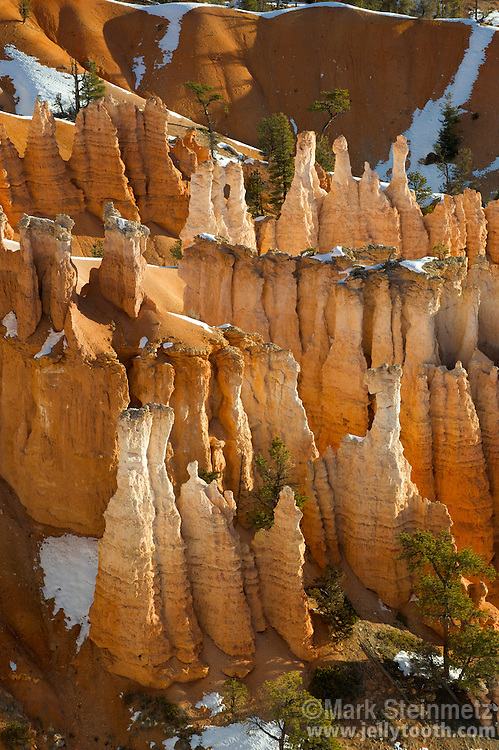 Early morning winter sun highlights hoodoos in Bryce Canyon National Park, Utah. Hoodoos are pinnacles or odd-shaped rock left standing by the forces of erosion. Technically not a canyon, most of the erosion at Bryce comes from the freezing and thawing of water, a prevalent occurence due to its high elevation of approximately 7,000 to 9,000 feet (2,133 - 2,743 m). In addition to ice, wind and water erosion also play a role.